The new ace:dataTable is the most advanced and powerful ICEfaces component yet! Based on the popular jQuery data grid component, this rich JSF datatable has been evolved significantly making it the most comprehensive and advanced JSF richdata table on the market today. And, it is freely available as part of the ACE Components, licensed under the Apache 2 open source license. The ace:dataTable is certified to operate in a consistent and uniform manner across the widest range of app servers, Java middleware, and web browsers. It is one of the few JSF data tables capable of operating seamlessly across IE 7, 8 and 9, Safari, Firefox, and Chrome. Find out more about ICEfaces and ace:dataTable supported platforms. The ace:dataTable has been optimized for sophisticated enterprise performance. It can easily be configured for server-based processing, via the ICEfaces framework, or to leverage client-based processing if stringent security requirements are less of a concern. Benchmark results demonstrate that the ace:dataTable can load a 3 million cell table in under a couple of seconds when using the built-in lazy loading feature. And, complex sorting and filtering operations can be carried out on 2,000+ row tables in less than 1 second on most advanced browsers. As part of the ACE library for ICEfaces 3.0, the ace:dataTable is regularly subjected to a comprehensive suite of tests across the full range of the ICEfaces Supported Platforms. Functional testing is carried out using Selenium, and test scripts are available for most ace:dataTable features as part of ICEfaces EE Subscriptions. Load testing is available using JMeter and separate Java Test Clients, and comprehensive memory leakage testing is performed as part of each product release. 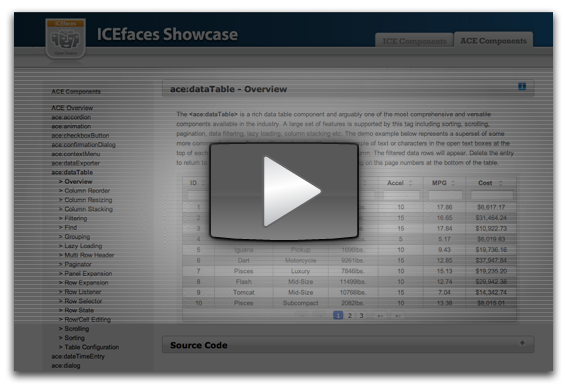 A comprehensive demo of the ace:dataTable is included in the ICEfaces Showcase, complete with over 15 sample implementations and corresponding TLD documentation. More complete documentation for the ace:dataTable is available here.